Inhost Review 2019: Is Inhost a Good Hosting? An all-American website hosting provider based in Los Angeles, with American support staff and data centers located in the U.S.A. A well-established company that has been in business for a long time. Founded in 1999, Inhost is a proudly American, family owned and operated web hosting provider. Their data center and staff are located in Los Angeles, and their website and support are available in (American) English. Inhost doesn’t advertise how many customers they currently work with, but it’s clear that this very well established company has been in business for a long time. What strikes me as unusual about Inhost is their relatively relaxed attitude to their inclusions. For example, instead of offering an uptime SLA or guarantee, they simply state “As close as you get to 100% uptime.” That’s a little vague, don’t you think? Equally vague is the information regarding their hardware or infrastructure. It’s easy to deduce that their data centers are in America, but whether they are Tier I, II, III, or IV, and whether the company manages their servers themselves is something of a mystery. I don’t know about you, but I’d like a little more concrete information before making my decision. On the other hand, their website is simple and jargon-free, meaning that most beginners can quickly get started. Their inclusions are clear, and instead of using the misleading ‘unlimited’ terminology, they use concrete quotas for both storage and bandwidth. For example, the base package includes 1 GB of storage and 20 GB of bandwidth, whilst the second-largest package includes 10 GB storage and 150 GB per month bandwidth. Okay, so they do use the word ‘unlimited’ in relation to their largest package that includes unlimited bandwidth. In terms of setting up, it takes up to 24 hours to go live, which is a little slower than most shared hosting providers. Unfortunately, Inhost’s prices are high compared to both local and international companies. There are also a few add-ons which are charged in addition to the base price, such as anti-spam software, SSL certificates, and even backups. At the checkout, you are given the choice of several different contract lengths including monthly, quarterly, semi-annually, annually, biannually and triannually. You do get discounts for purchasing for longer periods, but the discounts are quite minimal. No other discounts, free trials, or money-back guarantees are on offer. Like the rest of the website, the customer service section is pretty stripped back. They provide a telephone number and email address. They do not advertise their opening hours or their average response time. I’ve also had to wait a few days to get a response via email, which is longer than I would like. That said, they do have a knowledge base and network status page on their website, and they do claim to commit to 24/7 technical support. Inhost offers a variety of services fronted by a no-frills website. In addition to standard hosting, they offer an e-commerce hosting package with product pages, Shopify cart integration, and payment processing. 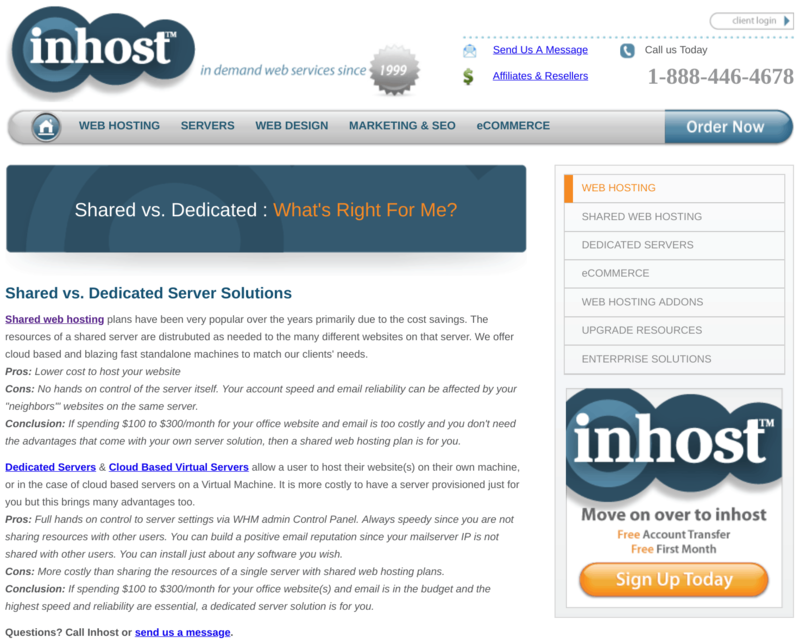 Wondering how Inhost stacks up against other Web Hosting companies? Enter any other Web Hosting company and we will give you a side-by-side comparison.